I’m losing more and more reasons every day, it seems, to complain about the state of dining in Roanoke (not that there was *that* much to complain about anyway). See, this month for the first time ever, Roanoke decided to hold a Downtown Roanoke Restaurant Week. For one week straight (going on now through tomorrow evening), many downtown restaurants are offering $10 lunch combinations (normally 2 courses) and either $20 or $30 dinner options (generally three courses)–and for some of those restaurants, take Alexander’s–$30 for 3 courses is a total steal. And I don’t have to feel iffy about it like I would if I were using a Groupon. 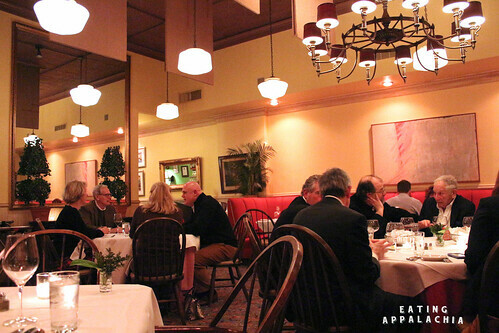 I’d never been to Alexander’s before Wednesday night and, while I’d always been curious (most have told me that it was a good place to eat), it wasn’t on my must-eat list for the town. Why? Well, I had this notion that it was stodgy, old-fancy, in that early-90s outdated way. Turns out that although the decor is a little dated, the food itself is top-notch. 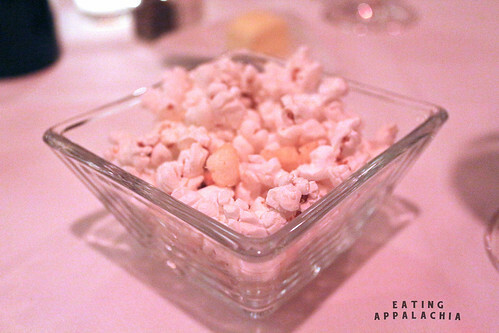 Some things are a little overdone or passe, like the Organic Popcorn, Truffle Oil, and Fried Mochi, but I respect the attempt. Personally, I’d love to see truffle oil banned from all the things. All of them. It just smells so much like truffle oil. And it’s fake. 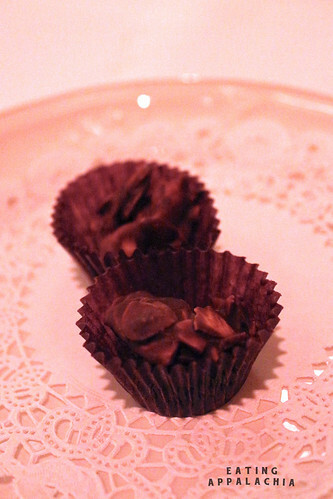 Give me something with a real truffle or give me nothing at all. But I liked the addition of fried mochi to the pre-appetizer snack course–I can’t think of any other restaurant in town playing around with mochi (maybe Metro?) and it did pair well with the popcorn. Just no more tuffle oil. I’m begging you. For the appetizer course, G & I went with the Salad Vinaigrette of Seasonal Lettuces & Tuscan White Bean Panzanella and the Pumpkin Bisque with Wild Mushrooms, Spiced Pepitas, & Smoked Paprika Oil. 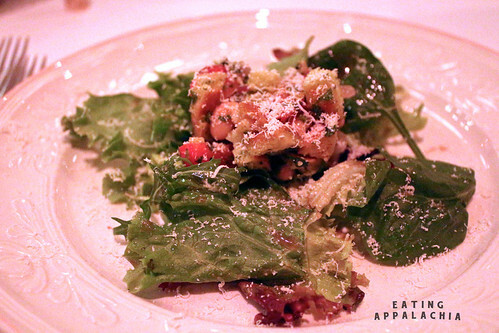 The salad felt perfectly seasonal, surprising for a leaf lettuce-based salad, and I think the white bean panzanella is what brought it all together. Given that I traditionally associate panzanella with summer, I thought the beans gave the salad a more hearty, wintery feel, and I loved the light vinaigrette. As for the soup? Oh god, let me tell you about the soup. Divine. Luscious. [Insert some other overused and not very descriptive word here…like…yummy?]. In all seriousness, though, the soup was incredible. 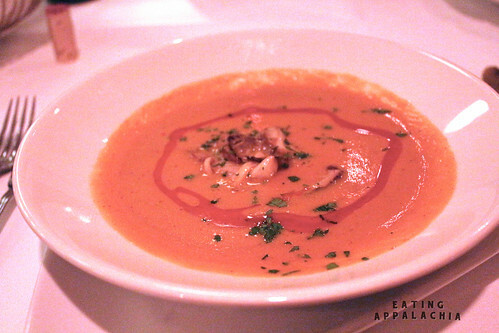 The pumpkin bisque was rich with some deep, woodsy undertones (mushroom broth, perhaps? Or just a really rich vegetable broth with some sort of umami?) and the mushrooms were perfectly cooked–a little bite, adding a good earthiness to the dish. And then the smoked paprika oil? It added the smoky, bright flavor of paprika with just a dash of heat. Let’s just say I wiped that bowl with baguette as well as any dishwasher could. So watch out, the bowl you get the soup in might not have actually been washed. Blame me, they couldn’t tell the difference. Main courses were easy to choose as I’m not a huge salmon or chicken fan (they both have their place–mostly at home since I can cook both pretty well). 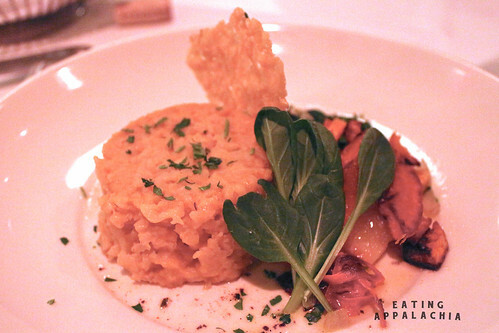 G went with the Lamb Ragout with Marscapone Polenta, Oven Charred Carrots, Tomato & Chef’s Turnips, while I chose the vegetarian option–Roasted Butternut Squash Risotto, Wilted Chef’s Garden Collards, Melange of Roasted Winter Vegetables, Micro Greens, and a Parmesano Reggiano Tuile. Now that’s a mouthful (in more ways than one). The lamb ragout was G’s favorite dish of the night (and a close second to my choice of the soup as the best)–the lamb tender and falling off the fork, the tomato and wine sauce rich, the vegetables roasted perfectly. 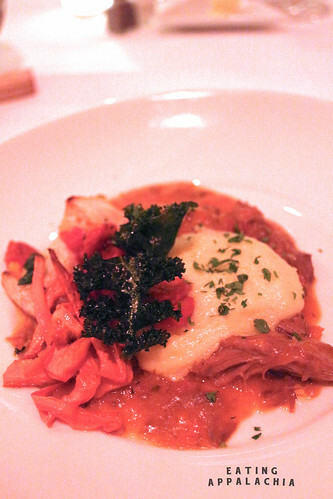 I really enjoyed the creamy, yet light, marscapone polenta–I think the choice of marscapone added a nice lighter profile to the dish–and the tiny kale chips on top were adorably delicious. Kale chips beat inedible parsley sprigs any day of the week. No question about that. My entree was good, but not as spectacular as I hoped. I really enjoyed the roasted vegetables–the turnips were enlighteningly good (I’ve got to figure out how to roast root veg better) and the braised collards were tender yet still green–exactly how a collard green ought to be treated. As for the risotto? It tasted good, but, seriously, that ain’t a risotto. If it can stand up from a mold, then it isn’t a risotto. Where was the creaminess? The dripping off a spoon, light yet hearty quality that a good risotto brings to the table? This one had the moisture content of El Crappo ‘Mexican’ restaurant’s ‘Mexican Rice,’ which, while good at a Tex-Mex place, isn’t what I want in a risotto. So…it tasted great (who doesn’t love roasted butternut puree mixed in things?) but was an abysmal attempt at risotto. All in all, I’ll give the dish an 80 out of 100 for the successful flavors (and for a good vegetarian dish in this city which is hard to find). And, finally, the dessert course–the course G & I are least likely to order if not for tasting menus. G’s Profiterole with House Made Fromage Blanc Ice Cream and Raspberry Zinfandel Sauce was a pretty good dessert overall. Maybe a little tart for my palate from the raspberries, but the profiterole and fromage blanc ice cream worked well as a palate for the sauce. I was grateful to see something more playful than vanilla bean for the ice cream and the fromage blanc was light with a slight tangy backnote–I could have eaten another scoop of it for sure. My dessert (which I grudgingly shared) was the Chocolate Mousse with a Meringue Napoleon and a Bittersweet Chocolate Sauce. Ok, yes, chocolate mousse. Now that’s overdone. Yes, true, but this one was rich and dark and barely tasted sweet–now that’s a good mousse. 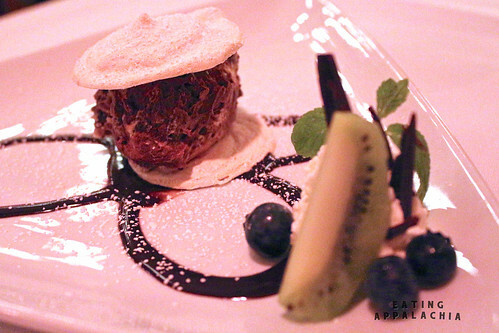 And the crisp meringues gave a playful texture to the dish. Could have done without the underripe kiwi, but it did look pretty. Looking back at the meal, I’m bowled away by how interesting and innovative so many of the dishes were–not stodgy at all like I expected–and I can’t believe how easy it was to eat a vegetarian meal (that was filling). I’m not sure we’ll be at Alexander’s every week, but I do see it being a part of our regular rotation now and I’m grateful to the Restaurant Week for finally getting me in the door. 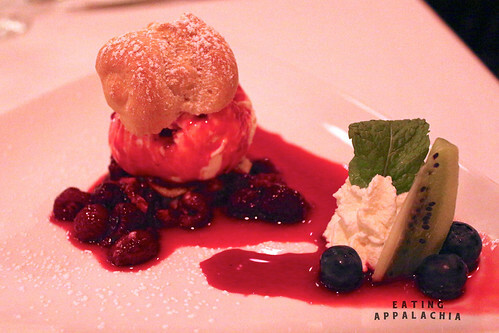 French cuisine & Appalachian ingredients–I don’t think I’ll ever get tired of that combination. Thanks for the link love, my dear! Restaurant weeks are always so exciting. Perfect opportunity to try a new place, and it’s a win-win for both the diner and restaurant. Looks like you found another gem!